I channel spiritual guidance to shine light on all challenges with all partnerships: business and personal issues.Shift and Manifest Now! I have been intuitive since I was a child. I believed everyone had my gifts, and it was astonishing for me to find out that I was different. I always had a gift of "knowing", whether it was how someone felt about me, or thought about me, or what they most likely would do next. I also would sense which would be the best path for me to take when I had several choices to make. And people would always think I was just "lucky." This gift has allowed me to create so many miracles in my life and now it is an honor to share my gift with others. I have traveled the world, and regardless of the distance and cultural differences living in different cultures… I always "just know" what someone is thinking, feeling, believing" and this has help me in every area of my life. The way that I connect with my clients is by receiving impressions and messages through Clairaudience (clear hearing) Clairsentience (clear feeling, touch, emotions, thinking patterns), Claircognizance (clear knowing "I just know) and as a medium. I have given over 15-thousand readings over my lifetime, and I am ever so grateful for the wonderful clients that I have been blessed with. The way that I connect with my clients is by receiving impressions and messages through clairaudient (clear hearing), clairsentience (clear feeling, touch and emotions), claircognizance (clear knowing) and as a medium. 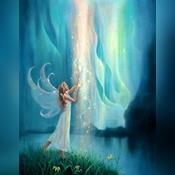 As a medium, I can channel spirit to offer guidance with the most personal of issues regarding all present situations. I am often able to receive guidance to help shift a situation in a more positive direction, or to speed up the vibration to attract a a desired outcome. in some cases, spirit reveals information that allows for deeper understanding in accepting the present. knowing that the energy will change and shift in a more positive direction. I prefer NOT to channel loved ones whom have passed over, except on rare occasions. By being an open channel, I can foster spiritual guidance so that my client may have peace of mind on all matters, regardless of the specific circumstances, challenges and life events. I use my gift to channel so that my client can see all the potentials in terms of their actions and thoughts so that one may create the best possible outcome in all circumstances in the given moment. My passion in life is to guide people towards living their life of their dreams , creating their life fearlessly and joyfully, moment to moment. My gift to others is I offer insight into areas that can allow that person to create miracles and breakthroughs in their current challenges so one can accomplish all that one desires in all areas of life--love, finance, career and spiritual goals. I ask for my clients to please be prepared with questions. angeliclove has been a user of Keen since 2007. Getting Psychic Mediums advice from angeliclove through www.keen.com is safe, secure and confidential.